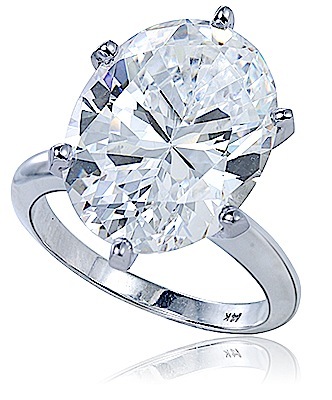 The Viceroy 9 Carat Oval Cubic Zirconia Classic Solitaire Engagement Ring features 16x12mm oval cubic zirconia set in a classic six prong head. 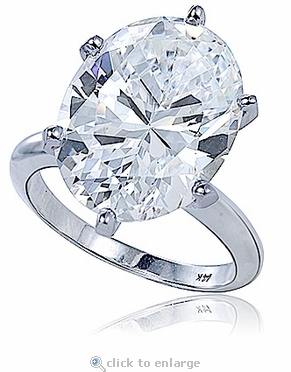 The prong set 9 carat lab created laboratory grown oval features a shank with a rounded knife edge design for a classic tiffany styled solitaire engagement ring. The six prong die struck head beautifully secures the large oval center and allows the stone to give a flattering illusion of length to your hand and fingers. Its design is perfectly symmetrical, with 58 sparkling facets that are cut to genuine diamond specifications. All our lab created diamond look cubic zirconia stones are made from the finest hand cut and hand polished original Russian formula cubic zirconia and includes a lifetime warranty against cracking, scratching or loosing its original color or brilliance. The oval classic solitaire engagement ring features a total of 9 carats and a shank that measures approximately 2.75mm in width at the widest point. This engagement ring is available in your choice of 14k white gold, 14k yellow gold, 18k white gold, 18k yellow gold and luxurious platinum. Please see the pull down menu for options. For further assistance, please visit us via live chat or call us directly at 1-866-942-6663, option 2 and speak with a knowledgeable representative.